It’s one of those weird sets where one of the best cards in the set is a common. Hello Pojo Readers, Crunch$G here and I’m here to tell you what you should know about the latest main set release, Soul Fusion. This set supports several archetypes of the past, creates an archetype with the basis from one really old card, and introduces a few new archetypes to us. The main selling point of this set seems to be the return of Fusion Summoning with a meta relevant archetype in this set that uses Fusion Monsters. With all that out of the way, let’s talk about some cards in here, cause there are several talking points to be made. First off, I’ll mention some of the imports in this set and one of the TCG Exclusives that isn’t part of the Danger! or Noble Knight archetypes. 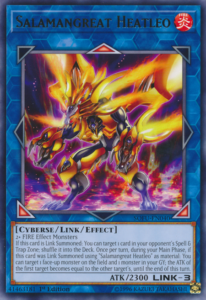 First off is the TCG exclusive, Alviss the Nordic Alfar which when banished by the effect of a Nordic Link Monster (it’s like we just got one recently :P) you can send a Nordic monster you control and 2 Nordics from the deck to the GY with their Levels equaling 10 to summon an Aesir from your deck and when an Aesir you control is removed by your opponent, you can banish Alviss from the GY to get another Aesir from your Extra Deck with a different name from Aesir monsters you’ve used already. Next up is D/D/D Flame High King Genghis, a Fusion that lets you revive a D/D from the GY when you Special Summon a D/D and negates the effect of a Spell/Trap on your turn. We also have Predaplant Dragostapelia, a Fusion for Predaplants that lets you place a Predator Counter on your opponents monster, which would change its level if it had one to Level 1 and Dragostapelia will negate the monster’s effects. Ostinato is a Fusion Spell for Melodious that lets you use your hand or deck for Fusion Materials, but the Fusion Monster is destroyed in the End Phase and you get to revive the Fusion Materials. 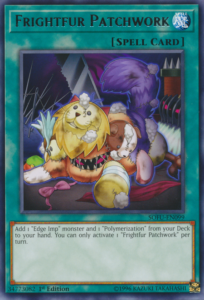 The final noteworthy import is Frightfur Patchwork, a spell for Fluffals that searches for an Edge Imp and a Polymerization at the same time and has been highly awaited for by many players. There are other imports, but I feel those are the most noteworthy and this article will get very long if I talked about all of them. One of the new archetypes in this set is the Salmangreat. Now, talking about all their effects can get a little long, so I’ll try and make this as short as possible. All the main deck Salmangreat monsters basically synergize with other Salmangreat monsters where if you use the effect of one of them, you can likely get the effect off from another Salmangreat if you used the proper one. Their Link Monster, Salmangreat Heatleo is a Link-3 that needs 2+ Fire Monsters and puts a Spell/Trap the opponent controls back into the deck and also if you Link Summoned Heatleo using another Heatleo, Salmangreat Sanctuary helps you Link Summon a Salmangreat Link by only using a Salmangreat Link with the same name, you can change the ATK of the monster on the field to the ATK of a monster in your GY. Salmangreat Emerald Eagle is a Ritual that lets you destroy your opponent’s Special Summoned monsters if you Ritual Summon it with another Salmangreat Emerald Eagle on the field and you can also tribute a Salmangreat Link Monster you control to destroy an opponent’s monster Emerald Eagle battles this turn and deal damage equal to said monster’s ATK. The clear theme here seems to be use effects of Salmangreats to trigger other Salmangreats in your Main Deck and use your Boss Monsters to summon the same Boss Monster to get the full effects of them and it will be interesting to see how it ends up in the future. They are all Cyberse monsters, so they work with generic Cyberse support at least. Next up is the Dinowrestler archetype, which can work well by splashing a few into a Dinosaur deck. Capoeiraptor cannot be destroyed in battle in Attack Position, but switches to Defense after it was attacked, and if it is in Defense during your Standby Phase, you can summon a Dinowrestler from your deck. Capaptera lets you send a monster your opponent controls to the GY if they have more monsters than you do and gives a Dinowrestler that uses it as Link Material 1000 ATK for the turn. Systegosaur lets you search for a Dinowrestler monster or World Dino Wrestling when Special Summoned and when it is in the GY and your opponent has more monsters than you do, you can revive a Dinowrestler that isn’t Systegosaur. Pankratops can Special Summon itself from your hand when your opponent controls more monsters than you and can let you tribute a Dinowrestler during either player’s turn to destroy an opponent controls and if this was just some card that wasn’t part of an archetype and had to tribute itself instead of any archetypal card this would still be played in almost every Main or Side Deck because it is great for going second and it is likely going to be a chase card of the set. Their Link-3, Dinowrestler King T Wrextle, prevents your opponent from using Spells/Traps when it attacks, prevents your opponent from attacking monsters that isn’t T Wrextle, and at the start of the opponent’s Battle Phase, you can target an Attack Position monster they control and your opponent cannot attack until the selected monster attacks and if it doesn’t attack, it is destroyed during the End Phase. 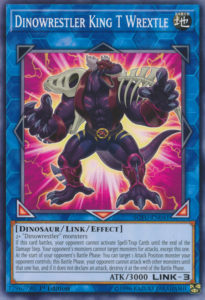 Their Field Spell, World Dino Wrestling, only lets a player attack with one monster during each Battle Phase if you control a Dinowrestler, gives a Dinowreslter 200 ATK during Damage Calculation if it attacks, and can banish itself from the GY to Special Summon a Dinowrestler from the deck. The cards seem solid to splash into a Dinosaur deck, especially Pankratops, and should be easy to get considering they are all common. Just don’t know if it was worth one of the main characters giving up Goukis for. Legendary Duelists 3 gave us some more Photon/Galaxy support, and this set continues with the same. Galaxy Cleric lets it attach itself from the hand to a Photon or Galaxy XYZ Monster you control and when summoned you can shuffle into your deck 5 Photon/Galaxy cards with different names from your GY into the deck to draw 2 cards. Galaxy Brave lets you reveal a Photon monster to summon itself from the hand and make its Level the same as the monster revealed and it will copy the ATK/DEF of a Galaxy monster in your GY. 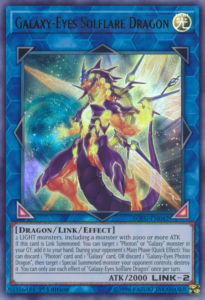 Solflare Dragon is their Link-2 that lets you grab back a Photon/Galaxy card from the GY when Link Summoned and during your opponent’s Main Phase lets you discard 2 Photon/Galaxy cards or 1 Galaxy-Eyes Photon Dragon to destroy 1 Special Summoned monster the opponent controls. Galaxy Trance lets you revive a Photon and summon a Galaxy monster from your deck as long as both have the same Level, but their effects are negated and their ATK becomes 2000 as well as you are locked into summoning Photon/Galaxy monsters before and after it is activated. Eternal Galaxy, a Trap that was a promo in the Cybernetic Horizon Special Edition, lets you target a Photon/Galaxy XYZ monster you control and summon a Photon/Galaxy XYZ from the Extra Deck that is 4 ranks higher. Nice continuation from Legendary Duelists 3 and Photon/Galaxy just now became a better rouge deck maybe. For the first time since I believe Legacy of the Valliant in 2014, we have some Gravekeeper’s support. Headman lets you revive a Level 4 Gravekeeper in the GY in face-up Attack or face-down Defense and is unaffected by Necrovalley. Spiritualist lets you Fusion Summon a Spellcaster Fusion using itself and cards from your hand or field as material as long as you control Necrovalley. Supernaturalist is the first Fusion for the archetype and it gains ATK/DEF equal to the Levels of the monsters used as its materials x 100 (note, it needs 2 Gravekeeper’s monsters), it will also protect itself and your Field Spells you control from destruction effects if there is a face-up Necrovalley, and you can activate its effect to where during your End Phase you can search for a Gravekeeper’s monster or Necrovalley card. Necrovalley Throne is a Spell can search for a Gravekeeper’s monster or let you Normal Summon a Gravekeeper’s monster as an extra Normal Summon. 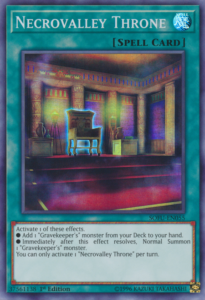 Necrovalley Temple is a Continuous Trap that debuffs opponent’s monsters by 500 ATK and DEF while you control a Gravekeeper’s monster and Necrovalley, can activate Necrovalley from your hand or GY if you don’t control a Field Spell in the Field Zone, and if your opponent destroys it then you can set a Necrovalley Spell/Trap from your deck that isn’t another Throne. Clearly the archetype is still focused on Necrovalley a bit, and that probably will never change cause Necrovalley is always going to be good. One of the most meta relevant archetypes in this new set is the Thunder Dragon archetype, which finally puts the Thunder-type in the meta scene really considering the only other Thunder archetypes are Watts, Hunders, and Batteryman and some of those are rogue at best. Now Thunder Dragons won’t be the best deck probably, but they can compete as an engine or as its own deck. The monsters are based around using effects in the hand, like the original Thunder Dragon, and getting effects when they are banished. 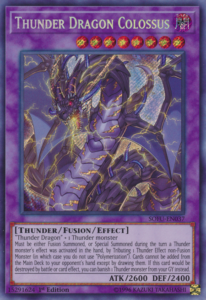 Thunder Dragonmatrix can discard itself during either player’s turn to boost a Thunder by 500 ATK and when it is sent from the field to the GY or is banished from anywhere it can search you another Thunder Dragonmatrix. Thunder Dragondark during either player’s turn can discard itself to search for another Thunder Dragondark and when sent from the field to the GY or banished from anywhere can search any Thunder Dragon card. 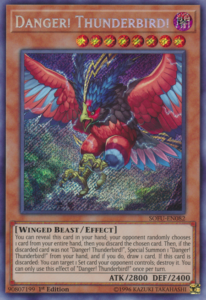 Thunder Dragonhawk can discard itself to summon a Thunder Dragon from your GY or that is banished and when it is sent from the field to the GY or is banished you can shuffle cards from your hand into the deck and draw the same number of cards shuffled back. 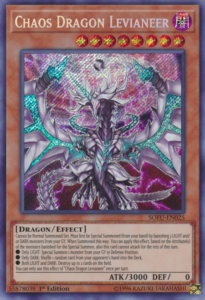 Thunder Dragonroar can discard itself to add back to your hand a Thunder Dragon in your GY or that is banished and when it is sent from the field to the GY or banished you can summon any Thunder Dragon from your deck but it’ll go to your hand in the End Phase. Thunder Dragonduo cannot be Normal Summoned/Set and must first be Special Summoned from the hand by banishing a LIGHT and DARK from your GY, it gains 300 ATK for the turn if a Thunder monster uses its effect in your hand, can banish a card from your GY to search for a Thunder monster when it destroys a monster in battle, and during your opponent’s End Phase can take one of your banished cards and put it at the top or bottom of your deck. 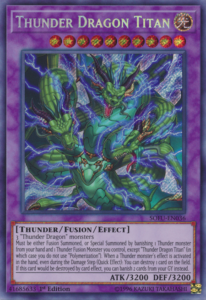 Thunder Dragon Colossus is their first Fusion that needs the original Thunder Dragon and any Thunder monster, or you can tribute a Thunder monster you control the same turn you used a Thunder monster’s effect in the hand, and while on the field your opponent cannot add cards from the deck to their hand except by drawing them, and it can banish a Thunder monster in your GY to prevent itself from being destroyed. Thunder Dragon Titan is their other Fusion Monster that needs 3 Thunder Dragon monsters or you can banish a Thunder Fusion monster you control and a Thunder monster in your hand to summon it, and multiple times in a turn it can destroy a card on the field when you use the effect of a Thunder monster in your hand and can save itself from effect destruction by banishing two cards in your GY. 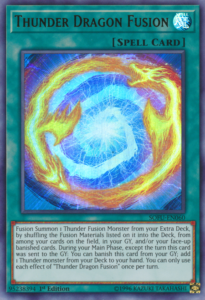 Thunder Dragon Fusion is the archetypal Fusion Spell that can Fusion Summon a Thunder Fusion by shuffling into your deck the materials on your field, in your GY, and face-up banished and during any turn it wasn’t sent to the GY you can banish it to search for a Thunder monster. The archetypes also have two Traps, but this part has already gotten pretty long and the Traps aren’t as common in Thunder Dragon builds of any sort. Overall, this is great for an engine or as a deck, both cases will need Gold Sarcophagus though. The next World Legacy archetype is the Orcust archetype, which all the main deck monsters banish themselves from the GY to summon an Orcust monster from varying places including the hand, deck, and GY. 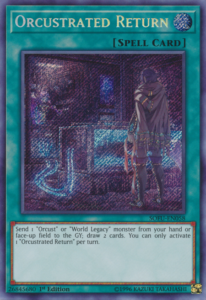 World Legacy – “World Wand” can banish itself from the GY to summon a banished Orcust monster, though. Galatea, the Orcust Automaton is their Link-2 that when Linked cannot be destroyed in battle and can shuffle one of your banished Machine monsters into your deck to set an Orcust Spell/Trap from your deck. 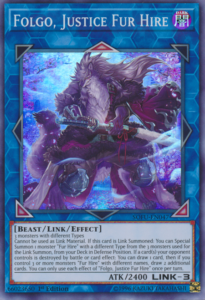 Longirsu, the Orcust Orchestrator is their Link-3 that when Linked cannot be destroyed by card effects and can shuffle two of your banished Machine monsters into the deck to send a Linked monster your opponent controls to the GY in exchange for Longirsu’s attack for the turn. 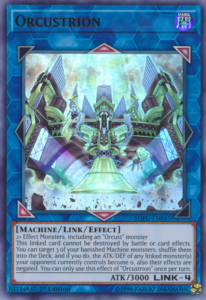 Orcustrion is the Link-4 Boss Monster that while Linked cannot be destroyed by battle or card effects and can shuffle three of your banished Machines into the deck to negate the effects of all your opponent’s Linked monsters and make their ATK and DEF 0. Orcustrated Babel is their Field Spell that can make the Orcust monsters in your GY or the Orcust Link Monsters you control have Quick Effects for all their effects and while in the GY except the turn it was sent there can let you discard a card from your hand to add it to your hand. Orcustrated Return is a Spell that lets you send an Orcust or World Leagcy monster from your hand or face-up on your field to the GY to draw 2 cards. Orcustrated Einsatz is a Continuous Spell that when your opponent Normal/Special Summons once per turn, you can take an Orcust or World Legacy card in your hand or deck and either send it to the GY or banish it. Similar to Thunder Dragons, the Traps in this archetype are subpar and typically aren’t played, so to make this shorter I won’t mention them. It is still a really good archetype, especially with Topologic Bomber Dragon, and can make for a solid rogue deck. The second wave of Danger! support is here and this is where you’ll probably begin to notice a dip in quality of the cards just like with many other TCG Exclusive archetypes. All the Danger! monsters still have the same effect where you reveal them in the hand and if your opponent doesn’t randomly select a card with that monster’s name, you can summon that monster from the hand and draw 1, otherwise discard the monster, so I’ll go over the unique effects of the Danger! monsters when they are discarded. Thunderbird! lets you destroy a Set card on the opponent’s field when discarded. Dogman! debuffs your opponent’s monsters by 1000 ATK and DEF for the turn. Mothman! lets both players draw and discard 1 card. Finally Tsuchinoko? 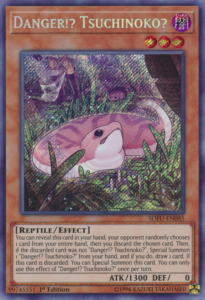 when discarded can revive itself from the GY so it is basically guaranteed to be summoned if you use its effect. The Spell and Trap both have the effect that while in the GY, you can discard a Danger! monster to place said Spell/Trap to the bottom of the deck and draw one card. Danger! Response Team is a Spell that when activated lets you bounce a Danger! monster you control and another monster on the field to the hand. Second Expedition into Danger! is a Continuous Trap that lets you discard a card and buff a Danger! monster by 500 ATK and DEF for the turn. Again, weaker support compared to the first wave, but all of the cards excluding Dogman! and Second Expedition are pretty solid, and Tsuchinoko? is amazing. The next archetype to talk about is the Noble Knight archetype, which got a fair amount of support in this set as well, and it is all pretty good. Noble Knight Iyvanne when equipped with a Noble Arms can summon a Noble Knight Token (Warrior/LIGHT/Level 4/1000 ATK/1000 DEF) but you can only summon Noble Knights for the rest of that turn, and Iyvanne boosts all your Noble Knights by 500 ATK while it has a Noble Arms equipped to it. Morgan, the Enchantress of Avalon is a hand trap that while you control a Noble Knight monster and a Noble Arms Equip Spell, you can discard Morgan from the hand to negate the negate the activation of a card or effect from the opponent and destroy a Noble Arms Equip Spell you control. 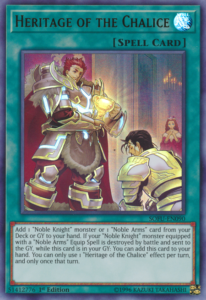 Heritage of the Chalice lets you add a Noble Knight monster or Noble Arms card from your deck to your hand and when a Noble Knight monster equipped with a Noble Arms is destroyed in battle, you can add it back to the hand. Until Noble Arms are Needed Once Again is a Trap that lets you excavate the top cards of your deck equal to the number of Noble Arms Equip Spells you control and add one of the excavated cards to your hand while the others go to the top of your deck in any order and it can also be banished from the GY except the turn it was sent to the GY to Special Summon a Noble Knight from your deck with a different name from the Noble Knights on your field and in your GY. Nice to see Noble Knights get a dedicated searcher, all the cards here are pretty solid and worth considering playing. Finally, before I get to the extra cards, I’ll talk about some of the Cyberse support in this set. 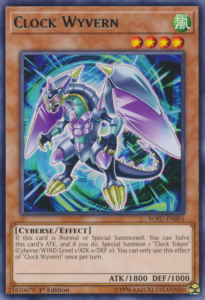 Clock Wyvern when Summoned can Special Summon a Clock Token (Cyberse/WIND/Level 1/0 ATK/0 DEF) to help with your Link Plays. Cyberse Clock Dragon is a new Cyberse Fusion monster that needs Clock Wyvern and 1+ Link Monsters as material and when it is Fusion Summoned, you can send the top cards from your deck to the GY equal to the total rating of all the Link Monsters used for its Fusion Summon to give Clock Dragon 1000 ATK per card sent from your deck to the GY but for that turn the effect is activated, only Clock Dragon can attack, also while you control a Link Monster, your opponent can only target Cyberse Clock Dragon for attacks or card effects (becomes a lock I believe when you control two Cyberse Clock Dragons ;)) Finally if your opponent sends Clock Dragon to your GY via card effect, you can search for any Spell Card from your deck. 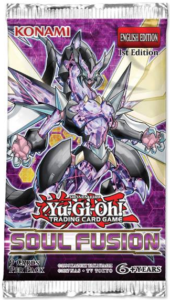 Diplexer Chimera is another Cyberse Fusion that only needs 2 Cyberse monsters and you can tribute a Cyberse monster you control to lock your opponent from using card effects during the Battle Phase that turn and when Chimera was Fusion Summoned and sent to the GY, you can add back to your hand 1 Cynet Fusion and 1 Cyberse monster. Clock Spartoi is a Link-2 that needs 2 Cyberse monsters and when Link Summoned can add a Cynet Fusion from your deck to your hand and when a monster is Special Summoned to a zone it points to, you can Special Summon a Level 4 or lower Cyberse monster from your GY but its effects are negated and your Extra Deck summons are locked to only Fusion Summons for the rest of that turn. 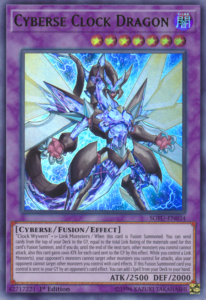 Cynet Fusion is the Fusion Spell for Cyberse that lets you Fusion Summon a Cyberse Fusion monster using monsters you control, in your hand, and if there are no monsters in your Extra Monster Zone you can use a Cyberse Link Monster in your GY. Cyberse Clock Dragon gives Cyberse some good OTK potential with a 1 hit KO and the other cards are good enough to consider running. Some more solid Cyberse support, they are just lacking the right support to become meta. Finally to talk about extra cards that aren’t really part of a set of cards mentioned before. Impcantation Penciplume and Bookstone add to the Impcantation archetype and they add back Ritual Monsters/Spells back from your GY to your hand. Chaos Dragon Levianeer cannot be Normal Summoned/Set and must first be Special Summoned by banishing 3 LIGHT/DARK monsters from your GY and if you banished only LIGHT monsters you can Special Summon a monster from your GY in Defense Position, if you banished only DARK monsters you can shuffle a random card in your opponent’s hand into the deck, and if you banished LIGHT and DARK monsters you can destroy up to 2 cards on the field but you cannot attack with Chaos Dragon the turn you use any of those effects. Diana the Light Spirit cannot be Normal Summoned/Set and must first be Special Summoned by banishing a LIGHT monster in the GY and during your opponent’s End Phase gives you 1000 LP. 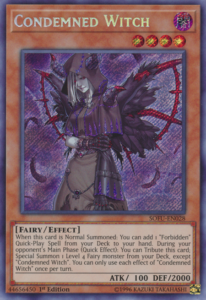 Condemmed Witch when Normal Summoned can add 1 Forbidden card (the cards with Forbidden in their name, not an actual banned card) from your deck to your hand and during your opponent’s turn can be tributed to Special Summon a Level 4 or lower Fairy except Condemmed Witch from your deck. Gokipole when sent to the GY can add a Level 4 Insect monster from your deck to your hand and if it was a Normal Monster, you can Special Summon it and destroy a monster with ATK greater than or equal to that Insect’s ATK. Token Collector can be Special Summoned from the hand or GY when a Token is summoned and when Special Summoned it destroys all Tokens on the field and gains 400 ATK per Token and prevents players from summoning Tokens. Crusaida Spartha is another Link-2 for Crusadia that has the standard Crusadia Link Monster effects and when a monster is Special Summoned to a zone it points to, you can move a monster in the Main Monster Zone except Spartha to another Main Monster Zone on the controller’s field. Folgo, Justice Fur Hire is a Link-3 for Fur Hires and needs 3 monsters with different types as materials and when Link Summoned you can summon a Fur Hire from your deck in Defense Position with a different type than Folgo’s Link Materials and if a card your opponent controls is destroyed, you can draw 1 card or if you control 3 Fur Hire monsters with different names, you can draw 2 additional cards. 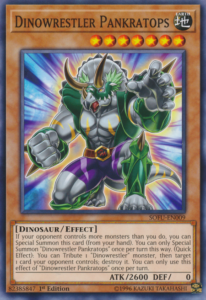 Agave Dragon is a Link-4 that needs any monsters except Tokens and when Link Summoned can inflict 100 damage to your opponent for each Dragon in your GY, gains 200 ATK for every Dinosaur in your GY, makes your opponent’s monsters lose 300 ATK for each Sea Serpent in your GY, and gives you 400 LP for each Wyrm in your GY. Some Summer Summoner is a Link-2 for the Thunder-type that needs 2 Thunders as materials and during your opponent’s turn you can discard a card to target a Thunder monster in your GY and Special Summon it to a zone it points to (Bottom Left and Bottom Right arrows). Giant Ballpark is a Field Spell that once a turn during damage calculation, if a player would take damage, you can make that damage 0 and send an Insect from your deck to your GY and if it was a Normal Monster, you can summon as many copies of it as possible from your hand, deck, or GY also if a monster you control is sent to the GY by your opponent’s card effect you can Special Summon a Normal Insect from your GY. Herald of the Abyss is a Normal Spell that at the cost of 1500 LP, you can declare a type and attribute and your opponent must send a monster with that type and attribute to the GY and for the rest of this turn, your opponent cannot use the effects of a monster with the same name as the monster they sent. 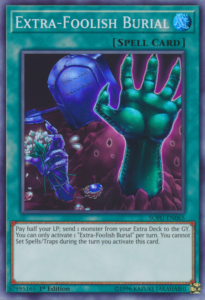 Extra-Foolish Burial is another Normal Spell that lets you pay half your LP to send a monster from your Extra Deck to the GY but you cannot set Spells/Traps the turn you activate it, but is handy for triggering GY effects of Extra Deck monsters. 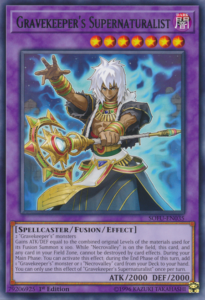 Necro Fusion is a Trap that lets you Fusion Summon by banishing the Fusion Materials from the GY face-down but said Fusion cannot attack the turn it is summoned. Toll Hike is a Continuous Trap that makes players send a card from their hand to the GY to attack. 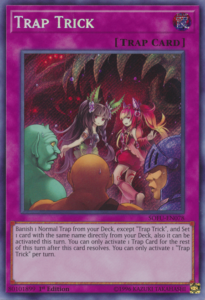 Trap Trick is a Normal Trap that lets you banish a Normal Trap from your deck to set a Normal Trap with the same name from your deck and it can be activated that turn, but you can only activate 1 Trap card after Trap Trick resolves. Finally, Consolation Prize can let you Special Summon a monster in the GY if it was sent from the hand to the GY. Overall, there are many cards in this category that can help other archetypes or give support to varying decks, so this set has a good batch of miscellaneous cards.